When an unemployed immigrant with a criminal record, Driss (Omar Sy), applies for the position of a live-in caretaker, he doesn't have any ambitions to be hired. He only wants one thing — another rejection signature so he can receive state benefits. This time around, he's turned out without one and told to come back the next day. The reason for the call back is apparent. Phillipe (Francois Cluzet) is a wealthy quadriplegic who has grown tired of the pity and patronizing manner of most professional caretakers. For him, Driss is an enigma as much as an inspiration. He seems to be the only one who can see the man beyond the wheelchair (if he even sees one). When Driss returns the following day, he is informed that the live-in job is on a 30-day trial basis. At the end of 30 days, Phillipe promises to give him the signature if it doesn't work out. Without any options, Driss moves in to be a caretaker. A story of spontaneous brotherhood. Although many French films are criticized for lacking character depth, writer-director team Olivier Nakache and Eric Toledano don't seem to have any problem penciling in the details of this true-to-life story. Neither do actors Omar Sy and Francois Cluzet, whose bond is both immediate and convincing. Part of the reason the story seems so complete might be because the plot is based upon the true-life story of Philippe Pozzo di Borgo and his caregiver Abdel Sellou. Borgo is a French businessman who became a quadriplegic in 1993 after a paragliding accident. "We were two desperadoes who sought a way to escape: the rich tetra [suffering from the] crazy pain of losing his wife and young boss comes out of jail and wants to blow everything up," Borgo once said in an interview. "Two guys on the fringes of society who rely on each other." The film is near perfect, creating a juxtaposition in that both men are fish out of water, attempting to find a second chance to put their lives back together. It also remains fresh in being a French film, without the usual concern for racism. Any prejudice in the film isn't based on race but rather socio-economic and physical disabilities, respectively. These disabilities are also the basis for their mutual attraction and not repulsion. They are interested in each other as people and everything they might learn from one another as both of them are being denied an opportunity to live. One has resources but not the ability. The other has ability but not the resources. Together, they help each other find something few people ever do. Their second chance comes from learning that most of their limitations come from their mindset more than anything materialistic. As soon as they open their eyes to the possibilities within their grasp, everything begins to change for the better. A bit about the writers and directors. There is something else that helped the story come together. Writers/directors Nakache and Toledano are long-time friends who have built an inseparable career together. Shortly after becoming friends, the duo began to produce dozens of short films before turning in their full-length film Je Préfère Qu'on Reste Amis, a semi-funny comedic film about two friends who chase girls. Since then, they have gone on to write increasingly better screenplays with more believable characters. Their talent truly culminates in this film as they seem to derive as much inspiration from their own friendship as the people upon whom the movie is based. They are also very familiar with Omar Sy, who they cast in their last three films. Interestingly enough, Sy isn't a formal actor and has never been to drama school. Also interesting is that these two friends were told not to touch the story. Even in France, it was considered too taboo to write anything comedic about disabilities, immigrants, or the projects. By going ahead anyway, they prove that provided it is done with authenticity instead of duplicity, filmmakers can bring humanity to a lighthearted film about trust and redemption. The Intouchables Breaks Barriers At 8.8 On The Liquid Hip Richter Scale. 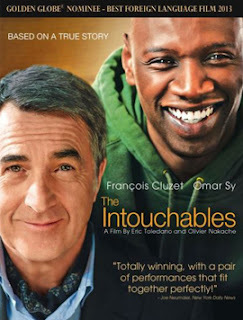 Called Intouchables in France and Untouchables in the United Kingdom, the title takes its cue from the notion that Driss sees Philippe as untouchable (because he has to be cleaned and cared for) while Philippe is frequently told Driss is untouchable because he comes from the projects. It's this social juxtaposition that affords them a commonality, one perfectly portrayed by Sy and Cluzet. The Intouchables received some American attention after being nominated for a Golden Globe in the category of best foreign language film. Foreign language film or not, it is arguably one of the best slice-of-life releases in the last two years (France in 2011 and other countries in 2012). The film was recently made available on DVD and other formats, which are available at Barnes & Noble. You can also find The Intouchables on Amazon or download it from iTunes.